Trade show shipping logistics are complicated. From trying to anticipate how much product you’ll need on hand to figuring out where to store and how to ship your goods to the final site, the headaches of trade shows can add up quickly. By working with a logistics company that understands the ins and outs of trade shows, you can focus your energy on ensuring you get the most out of your event. Learn more about trade show shipping logistics in today’s blog, below. Trade show shipping can be a hassle. AFP Expo can help. If your show booth or products arrive late at a trade show, it can spell disaster. Many events require a year or more of planning, and having that fall apart due to a freight company dropping the ball can seriously impact your bottom line, not to mention the undo stress that is caused. A problem with shipping will not only affect your ability to sell product, but it will also negatively impact your reputation and cause you to miss out on potential business. Because trade shows offer no second chances, it is important to work with a logistics company that is experienced with trade show shipping to ensure the event goes off without a hitch. At AFP Global Logistics, our AFP Expo department has been serving the trade show and event industry for over 25 years, and over half of all of our shipments each year are related to trade shows. Our dedicated customer service specialists constantly monitor your shipment from warehouse to delivery to provide you with end-to-end control. We will create a customized program to ensure your budget and timeline are met and we can ship directly to any venue or convention center. Our full truckload trade shipping services can accommodate large exhibits, while air freight is a great option for time-sensitive freight. Whether you ship a few times a year or exhibit at trade shows on a weekly basis, you can trust that AFP Expo has the experience needed to handle your trade show shipping with the utmost care and precision. 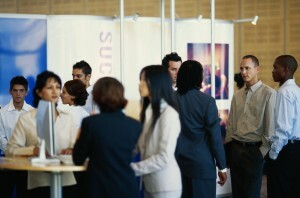 For a customized trade show shipping logistics experience, AFP Expo is the best and only choice! We provide a full range of trade show logistics services, and our 25 years in the business have given us the tools we need to tailor our logistic solutions to each and every individual customer. For more information or to start designing your own logistic solutions today, get in touch with AFP Global Logistics at 410.590.1234 (toll-free 800.274.1237), email us at info@afplus.com, or fill out our quick and easy contact form here! This entry was posted on Thursday, March 3rd, 2016	at 5:16 pm	and is filed under Trade Shows	. You can follow any responses to this entry through the RSS 2.0	feed. Both comments and pings are currently closed.